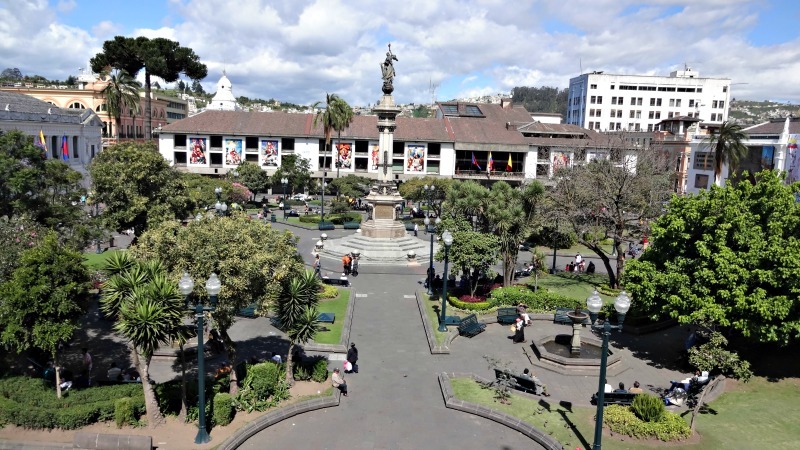 A great way to see the best areas of Ecuador's capital is on the Quito Bus Tour. This tour, organized by Quindetour, is really fun! 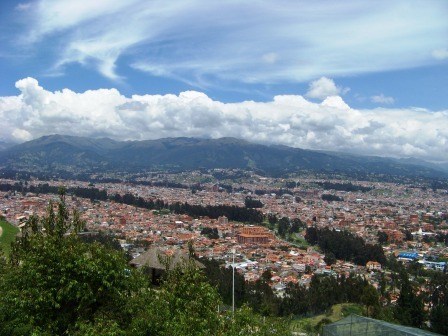 It's especially great if you have limited time in Quito or you would rather not walk all day long to see the sights. You can get on or off at any of the 12 bus stops. The buses pass every hour from 9 am to 4 pm. The tour is available everyday of the year and costs $15 per person (2015). Kids 12 and under and those over 65 pay half price. The double-decker buses are modern and very clean. There was even a retractable roof upstairs in case of rain. The tour has a recorded commentary in English and Spanish. There is also a tour guide on each bus that can offer suggestions and point out things to see at each stop. We got on at the Mariscal stop (shown above) a little after nine in the morning. It was a Tuesday morning and there were a few other people on the bus with us. The Quito bus tour begins on the far north side of Parque La Carolina on Naciones Unidas Ave. near the Quicentro Shopping Mall. Something new I learned: this huge park was donated by a wealthy woman to the city of Quito. The park offers a lot to see and do, including an orchid garden. The first stop after Naciones Unidas is the orchid garden. From there the bus continues into the Mariscal neighborhood, also known as Gringolandia due to the variety of hotels, restaurants and bars which makes it a popular place for tourists. We were staying just a few blocks from the Mariscal, so we walked to the bus stop (which is right at Plaza Foch) and started our tour there. Next the bus stops at the Ejido Park. Here you can see arts and crafts stands, especially on the weekends. As the bus enters the historic center of Quito you have the opportunity to see numerous examples of colonial style homes. The commentary points out one in particular, where Manuelita Saenz and Simon Bolivar are said to have danced. 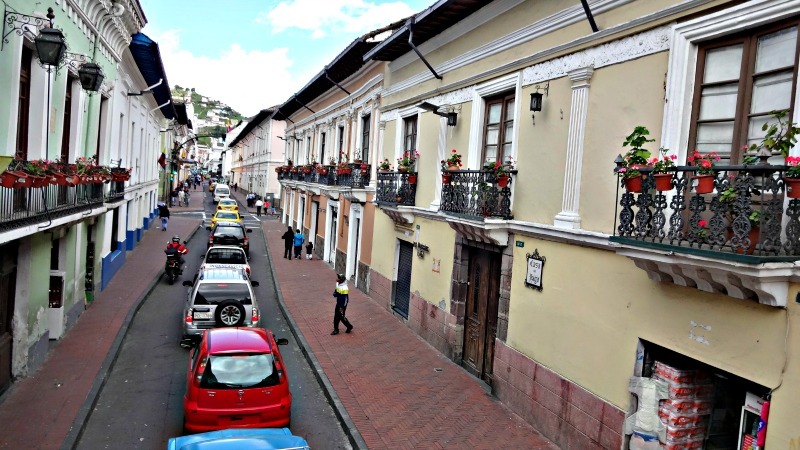 Narrow streets lined with colonial homes in Quito. The green house on the left is where Simon Bolivar is said to have danced with Manuelita Saenz. The first stop in Old Town Quito is at the Contemporary Art Center, which was once a military hospital. The center has ever-changing art exhibits and is free. The Basilica del Voto Nacional is probably one of most photographed churches of Quito, however it isn't really that old. Building began in the late 1800s, and it is still unfinished. According to legend, the end of the world will come when it is finished. The church has interesting animal figures depicting many of the animals found in Ecuador, including Galapagos tortoises, iguanas and armadillos. You can enter the church for a few dollars. If you do go in, climb the high clock towers for amazing views of Quito! La Basilica del Voto Nacional seen from the Garcia Moreno Park bus stop. From the Basilica the bus begins a circle around the Plaza Grande, the main plaza in the Old Town Quito area. You may want to get off at one of the next stops to explore things up close. First, the bus stops at La Compañía Church just beyond the Plaza Grande. Our guide said this was her preferred church. 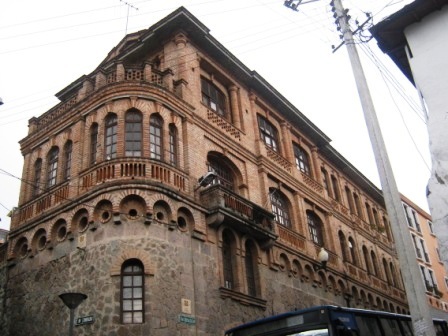 Nearby, the Museo de la Cuidad is said to be one of Quito's best museums. The bus then heads up to the Panecillo, where you find a winged virgin which looks over the city. 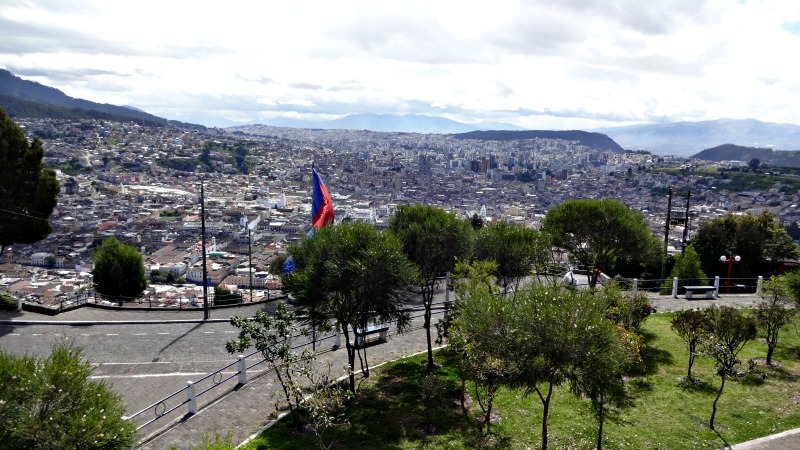 The views from the top of the hill are amazing and on a clear day you can see seven of the volcanoes that surround Quito. The bus stops here for half an hour to let you get out and walk around. There are bathrooms (15 cents) and souvenir stalls. After the short break, the bus heads back toward the Plaza Grande. It stops at La Ronda, Quito's oldest street, and then at the Plaza Grande. We decided to get off here and walk around. We walked the Ronda around to the other side of the Plaza Grande and then got lunch. After lunch we had a tour of the Presidential Palace (free!). We must have been off the bus for about three hours and walked out of our tour just in time to catch the hourly bus. 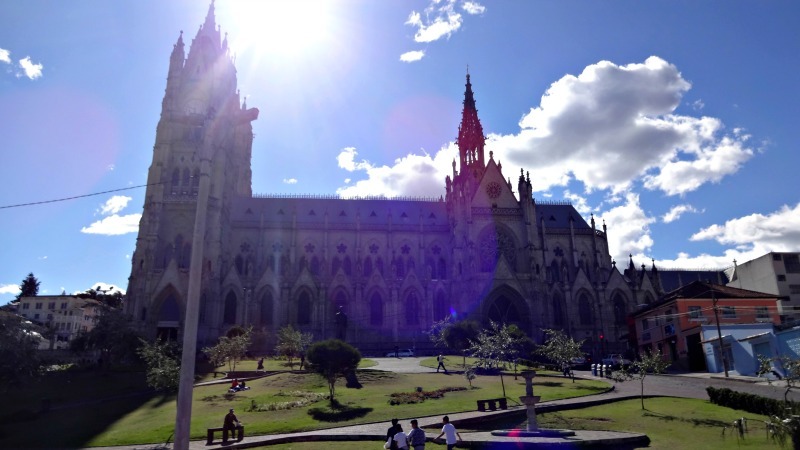 The Quito bus tour continues on to the Garcia Moreno Park (shown above in the photo of the Basilica) and then heads back to the Carolina Park. 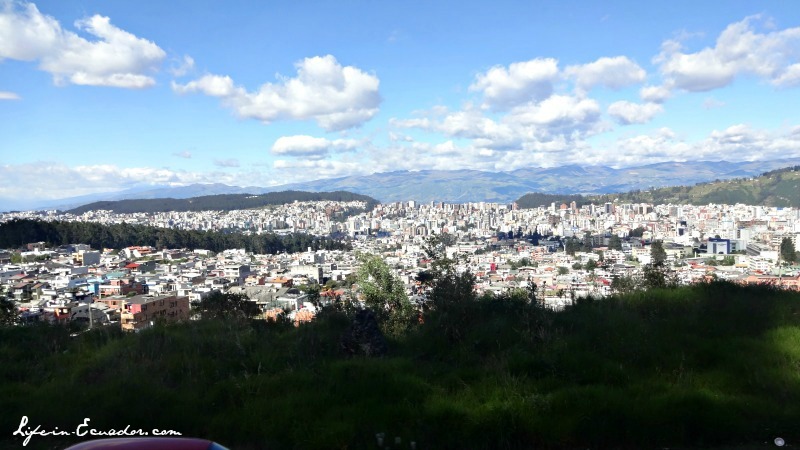 The trip back to La Carolina offers more great views of Quito and some interesting information about other points of interest in Quito. 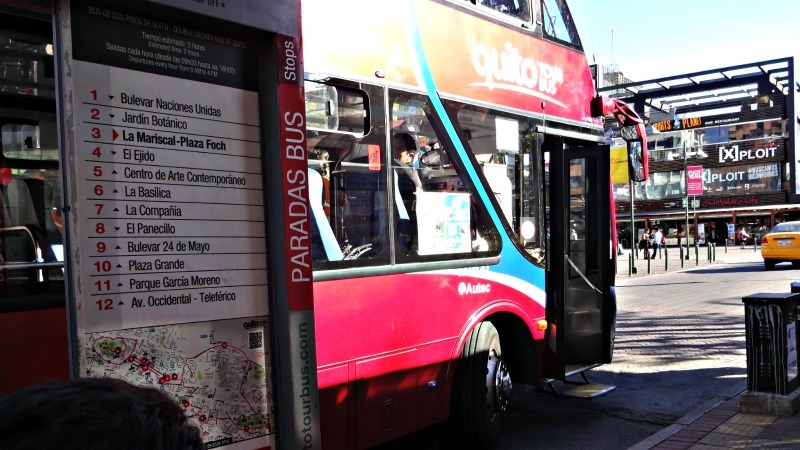 I really enjoyed the Quito Bus Tour. I learned a lot of new and interesting things about Quito. Plus, it's a great way to see a large part of Quito without wearing yourself out on its steep hills and traffic filled streets. The tour company also offers special tours to Mitad del Mundo and night tours of Quito several days a week. For more information about the tour and to see the special tours offered by Quindetour see their webpage here.